As a parent, you can be the hero in your fight against lice at home. With that in mind, we have developed a full line of science-based, non-toxic treatment products for any budget. Whether you choose to treat lice with heated air or a combing solution, or just want to keep lice away, we have a product for you. We believe retail lice removal and prevention products should be as effective as they are simple to use. detangles hair and facilitates the removal of lice and eggs—all with no mess. 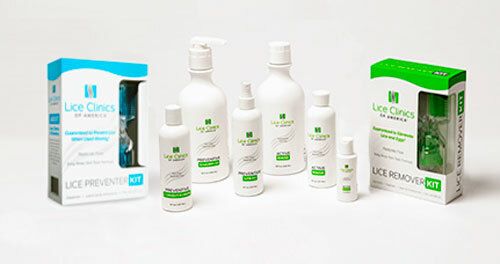 We developed the product using the same active ingredient we use in our urgent care clinics, where we have successfully treated hundreds of thousands of lice infestations. Our gel easily rinses out of the hair and has a fresh pear-blossom scent you’ll love. The kit also contains a unique dispenser for applying the gel, along with a sturdy comb for removing the lice and eggs. With the Lice Remover Kit, ending lice infestations at home is easy—and guaranteed (when used as directed). Other lice removal products are messy to use. They get all over your hands, counters and floors. It can be hard to coat the entire head with them. And they don’t wash out of the hair easily. By using the LRK dispenser, you get to carefully control the dosage as you spread the gel throughout the hair. With two comb-like sides, the dispenser allows you to not only apply the gel, but also remove lice. Rinsing the gel from the hair is simple. Simply wash with warm water and shampoo. No more stinky pesticides. The liquid gel in the Lice Remover Kit (LRK) contains a pleasant pear scent. The head lice treatment will smell and feel similar to shampoos and conditioners you already use on your kids. Just because it happens to kill lice doesn’t mean it has to smell like something you’d spray on your flower garden to kill weeds. For serious do-it-yourselfers, we offer the Home Treatment Kit (HTK). It contains a heated-air device that dehydrates and kills lice and eggs. In addition to the home lice device, the HTK contains two single-use device tips, two bottles of easy-rinse gel, a specialized dispenser and a reusable lice comb. With the HTK, you can successfully take care of a lice infestation in a single treatment at home. The HTK comes with a limited buyer’s guarantee if you are not satisfied with the product. The home lice device is similar to the FDA-cleared medical device (called AirAllé) we use in our clinics for professional treatments. The lice device produces carefully controlled air at a temperature that is safe on your kid’s head, but lethal to lice and their eggs. Because the device kills 99.2% of lice eggs (which are the hardest to kill), you will have a greater chance at curing the infestation—especially in a single treatment—than if you treat with just a comb and dimethicone. The lice device needs a tip to operate. The tips direct the airflow underneath the hair and along the scalp where lice live, feed and lay eggs. Tips come preloaded with enough time for you to do a single treatment. Once you get the lice gone, you’re going to want to keep them gone. We offer a prevention shampoo to help. Our preventive products contain essential oils that attack a louse’s olfactory nerves. The shampoo will smell pleasant to you and your child, but not to lice. Since lice move to new hosts primarily through head-to-head contact, they are less likely to move to a head that smells like this “stinky” shampoo. You can use the preventive shampoo daily, or whenever you normally wash your hair. Once you get the lice gone, you’re going to want to keep them gone. We offer a prevention conditioner to help. Our preventive products contain essential oils that attack a louse’s olfactory nerves. The conditioner will smell pleasant to you and your child, but not to lice. Since lice move to new hosts primarily through head-to-head contact, they are less likely to move to a head that smells like this “stinky” conditioner. You can use the preventive conditioner daily, or whenever you normally wash your hair. Once you get the lice gone, you’re going to want to keep them gone. We offer a prevention spray to help. Our preventive products contain essential oils that attack a louse’s olfactory nerves. The spray will smell pleasant to you and your child, but not to lice. Since lice move to new hosts primarily through head-to-head contact, they are less likely to move to a head that smells like this “stinky” spray. You can spray this preventive product on the head daily.